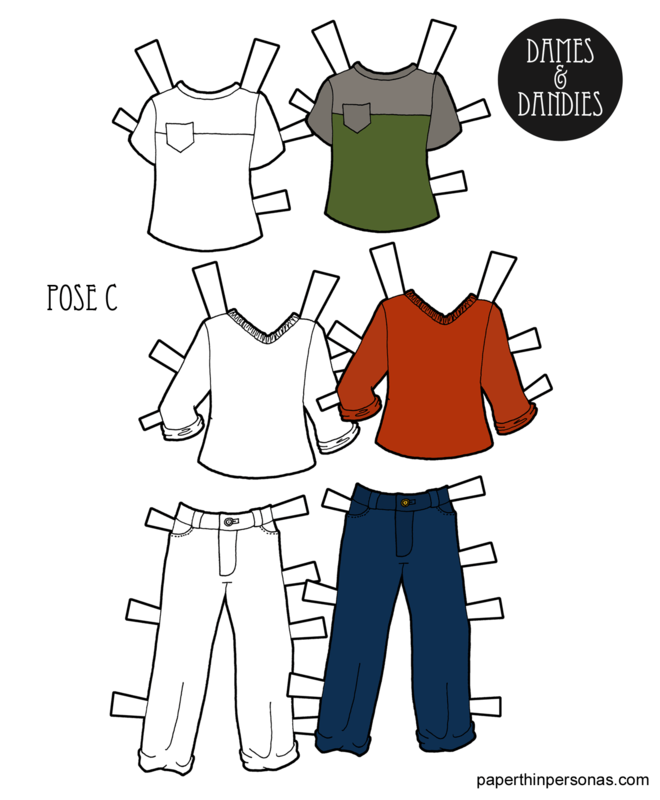 As I mentioned Wednesday, my initial plan was to start with this set for the Pose C paper doll guys, because I figured- All the guys I know wear jeans. And that thought won out. So, here are the jeans and basic tops. I figure the guys of pose C (or guy of Pose C, as there is only Changrui at the moment) can wear these to hang out with friends, go to the bar or on a casual date. The shirts are all based on things I’ve seen college students wearing. I have no idea what is fashionable for men these days, so I tend to rely on college student observation. I suspect college students tend towards the casual, so if I decide to draw some suits for the guys I’ll have to do some more research. The fact is that most men’s clothing in the last 50 years has changed in nuance, not substance. The width of the tie worn with a suit. The shape of the trousers. The presence or lack of a hat. These are the things that define men’s clothing. It’s all much more subtle than most changes to ladies clothing, but perhaps I only say that because I lack the practiced eye to analyze it. Something worth thinking about, I suspect. Any way, I am pretty satisfied with these jeans and I like the t-shirts. When I think of playing with paper dolls, I am reminded that they need basics as much as they need exotic options.